So I just have one question for Dameon Edwards, which is: Who the hell is Dameon Edwards? Mr. Martin: Excuse me, madam, but it seems to me, unless I’m mistaken, that I’ve met you somewhere before. Mrs. Martin: I, too, sir. It seems to me that I’ve met you somewhere before. Quentin: How did you know to put that there? Quentin: Angelique bought that, just for that place. Angelique: Well, it just seemed right, that’s all. Mr. Martin: Since coming to London, I have resided in Bromfield Street, my dear lady. Mrs. Martin: How curious that is, how bizarre! I, too, since coming to London, I have resided in Bromfield Street, my dear sir. 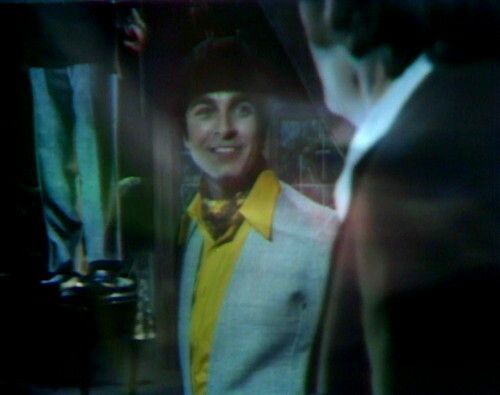 Mr. Martin: How curious that is, well then, well then, perhaps we have seen each other in Bromfield Street, my dear lady. Angelique: Surely you don’t think I’m Angelique again, just because I did that. Quentin: She would never let it be put anywhere else. Angelique: Quentin — you know who I am. Mr. Martin: I reside at No. 19, my dear lady. Mrs. Martin: How curious that is. I also reside at No. 19, my dear sir. 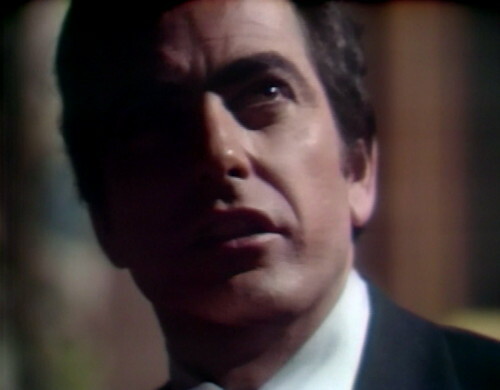 Mr. Martin: Well then, well then, well then, well then, perhaps we have seen each other in that house, dear lady? Quentin: Yes. You’re Alexis. I know that. A week ago, and I would have had doubts. But I no longer have any. 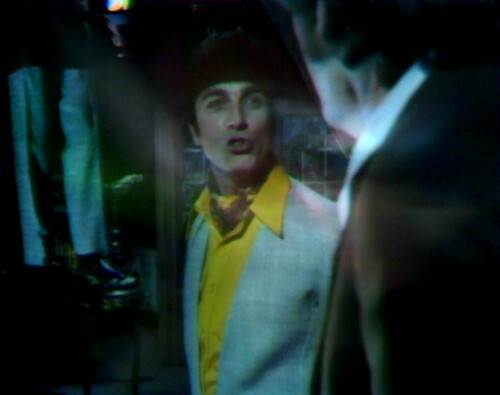 Mr. Martin: How bizarre, curious, strange! Then, madam, we live in the same room and we sleep in the same bed, dear lady. It is perhaps there we have met! Dameon: You know who I am! You know who I am! Dameon: You know who I am, Quentin! Do you know? Do you know? Mr. Smith: Here’s a thing I don’t understand. In the newspaper they always give the age of deceased persons but never the age of the newly born. That doesn’t make sense. Mrs. Smith: I never thought of that! Quentin: Dameon Edwards, what do you want from us? Dameon: She knows! She knows! Angelique: No, I don’t! I don’t, I swear I don’t! He has me confused with Angelique, I know he does! Quentin: You’re implying that he has a reason for hating Angelique! Angelique: But I know nothing about the two of them! Quentin: Now, what are we going to do? There’s got to be a power to get rid of him, out of this place! Angelique: Yes, there has to be. Quentin: We’ve got to find someone! Trask: Dameon, I can feel you here in this room! Trask: Give me a sign that you hear me! Dameon: What kind of a sign? Trask: Dameon, why won’t you give me a sign? Dameon: What are you talking about? Trask: I didn’t kill you, Dameon, I swear I didn’t! Dameon: Yeah, I never said that you did. Trask: Why are you here in this house? Trask: It’s Bruno you should be after! Dameon: I know. I’m taking care of it. Dameon: Yes, I know that, thank you. That’s why I’m not after you. You’re the one who brought it up. Mr. Smith: Goodness, someone is ringing. Mrs. Smith: I’m not going to open the door again. Mr. Smith: Yes, but there must be someone there! Mrs. Smith: The first time there was no one. The second time, no one. Why do you think that there is someone there now? Mr. Smith: Because someone has rung! Mrs. Martin: That’s no reason. Dameon: Quentin Collins! You must come to me! You must know! You must know! Quentin: What do you want me to know? Where do you want me to go? Dameon: I am at the door. Mr. Martin: When one hears the doorbell ring, that means someone is at the door ringing to have the door opened. Mrs. Martin: Not always. You’ve just seen otherwise! Mr. Martin: In most cases, yes. Mr. Smith: As for me, when I go to visit someone, I ring in order to be admitted. I think that everyone does the same thing and that each time there is a ring there must be someone there. Mrs. Smith: That is true in theory. But in reality things happen differently. You have just seen otherwise. Dameon: Do you feel my spirit? Mrs. Martin: Your wife is right. Mr. Martin: Oh! You women! You always stand up for each other. Mrs. Smith: Well, I’ll go and see. You can’t say that I am obstinate, but you will see that there’s no one there! Mrs. Smith: You see, there’s no one there. Quentin: What do you want me to know? Dameon: How it will end! Fire Chief: I am on official business. Mrs. Smith: And what can we do for you, Mr. Fire Chief? Fire Chief: Eh, well — is there a fire here? Quentin: You can summon the spirit of Dameon Edwards! Hannah: I don’t need to summon him! He’s here! Mrs. Smith: Why do you ask us that? Fire Chief: It’s because — pardon me — I have orders to extinguish all the fires in the city. Mrs.Smith: I don’t know. I don’t think so. Angelique: So that’s what Dameon is trying to do! Well, he won’t be able to. Hannah: How are we going to stop him? Angelique: I want you to go home. Come back here immediately. Mrs. Smith: Do you want me to go and look? Fire Chief: None at all? You don’t have a little fire in the chimney, something burning in the attic or in the cellar? A little fire just starting, at least? Angelique: The candles of the seventh secret. Angelique: You will bring them here immediately! Mrs. Smith: I am sorry to disappoint you but I do not believe there’s anything here at the moment. I promise that I will notify you when we do have something. Angelique: You are here, I can sense it! Fire Chief: Please don’t forget, it would be a great help. Mrs. Smith: That’s a promise. Angelique: And soon, it will be more than just a feeling! Fire Chief: Speaking of that — the bald soprano? Mrs. Smith: She always wears her hair in the same style. 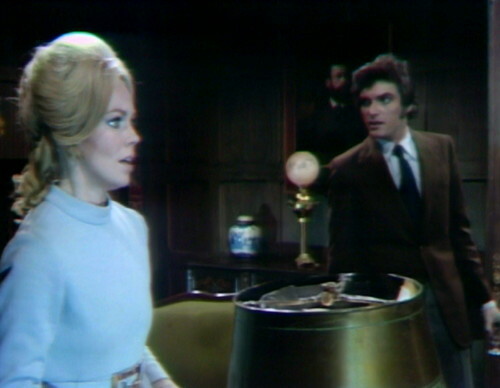 Angelique: Watch closely, Dameon! As I light the candles — and when the seventh one is lit, you will appear to me! We shall be here together, face to face, you and I! Fire Chief: Then goodbye, ladies and gentlemen. Mr. Martin: Good luck, and a good fire! Fire Chief: Let’s hope so. For everybody. Quentin: Dameon, what are you trying to tell me? Dameon, what does it mean? Dameon: It’s not that way, it’s over here, it’s not that way, it’s over here, it’s not that way, it’s over here, it’s not that way, it’s over here! Monday: Too Big to Do Anything But Fail. 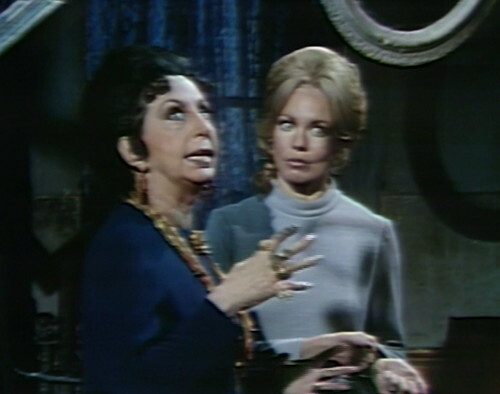 The dialogue quoted in today’s post was written by Sam Hall, Eugène Ionesco and Joe Caldwell, in Dark Shadows episode 1004, The Bald Soprano, and Dark Shadows episode 1005, respectively. 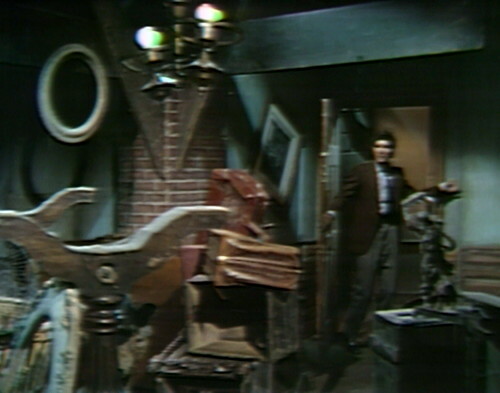 When Quentin goes up to the attic and looks up at the beam that he’ll be hanging from, you can see the studio lights, obviously. How they ever thought they could do that shot without seeing the lights is beyond me. There’s a lot of bumping around in the studio when Angelique asks Hannah if she can sense Dameon’s presence. At the end of act 1, Dameon’s ghost knocks something over on the floor. 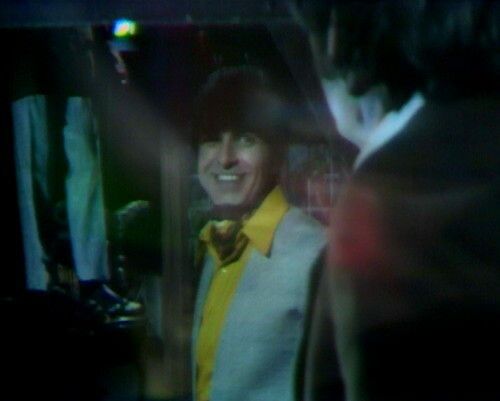 The stagehand pulling the string is visible at bottom right. 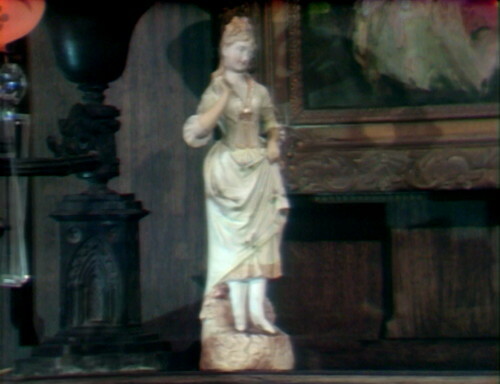 You can hear people walking around in the studio at the beginning of Cyrus and Angelique’s scene in the drawing room. Dameon’s spirit tries to blow out all five candles that Angelique is holding, but can’t quite manage it — there’s one that stays lit, even after three tries. 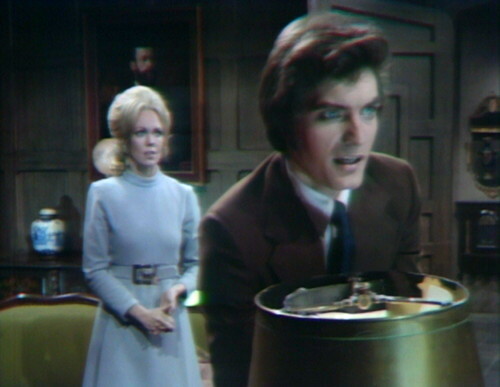 Angelique tells Dameon, “When the seventh one is lit, you will appear to me.” There are only five candles in the candelabrum. 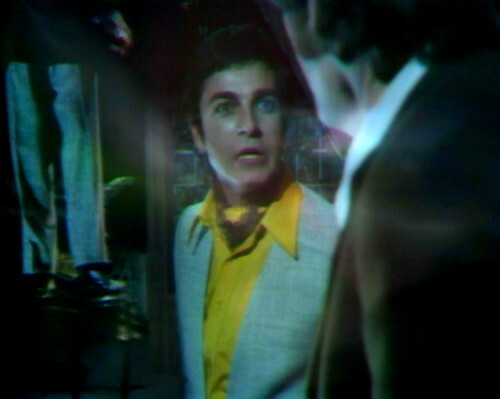 The camera pulls out abruptly from a shot of Angelique to a two-shot with the skeleton. They’re doing more editing today, so that they can have both a Cyrus scene and a Yaeger scene. They’ve been doing this a lot lately; it’s the third example in a week. 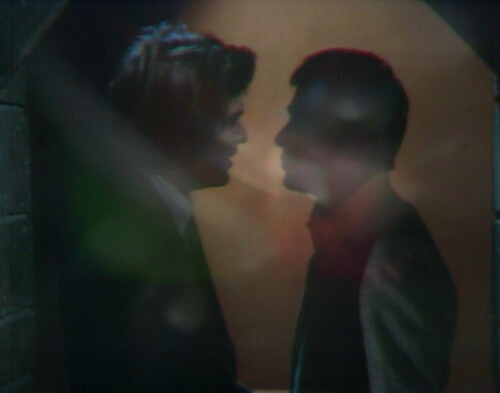 You can tell that the Yaeger/Gladstone scene was pre-taped, because the video quality degrades — that scene is obviously a second-generation copy. I knew those lines sounded familiar – THE BALD SOPRANO was produced here in Chicago several years back, and it’s probably the most I’ve laughed in a theater in years. Except for that time I won tickers to DIRTY DANCING: THE STAGE VERSION, of course, but then the laughter was for completely different reasons. Well played, sir! Everyone who reads the entire blog from beginning to end gets a free slice of my bachelor’s degree in self-defeating discordian trickster jargon, otherwise known as literary theory. So you finally got back fromTarrytown. 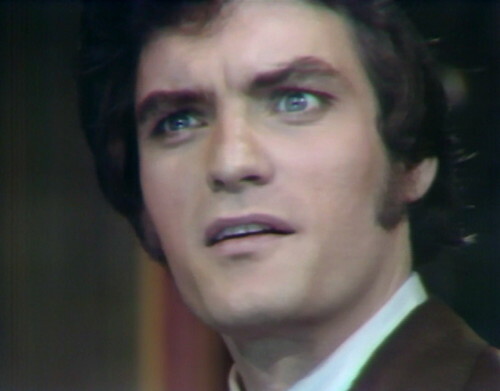 Can’t wait to see HOUSE OF DARK SHADOWS EVERY DAY, even if it is part of your plot to destroy this blog. Yes! 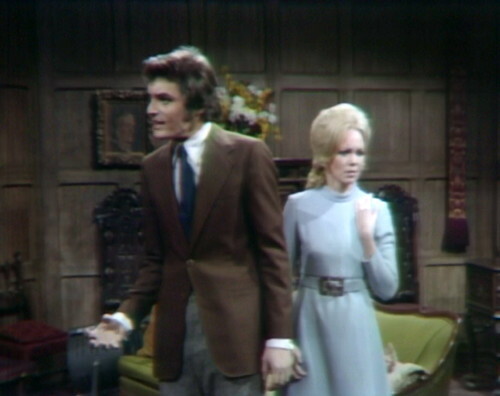 The House of Dark Shadows post is coming between 1010 and 1011, and it’s big and crazy and really fun. I would have settled for any one of those three! 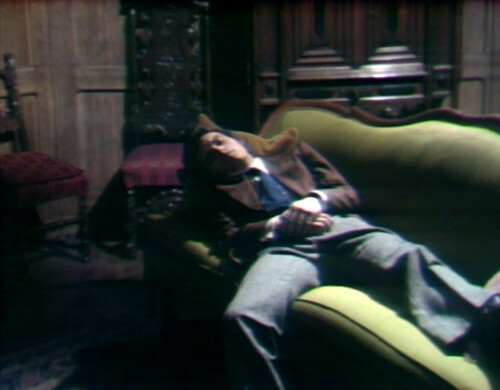 You should publish a book called HOUSE OF DARK SHADOWS EVERY DAY and make it a bad rewrite of the first 13 weeks of this blog. I’m Angelique, I’m Alexis, I’m my own Grandpa, and I am my sisters and my cousins and my aunts, my sisters and my cousins whom I reckon up by dozens, and my aunts. And tell us every detail of Caratacus’ uniform? Too bad no one was trying to talk sense to the writers. An annoying plot isn’t a better alternative to a boring plot. And here we get BOTH. Always hated this “Columbo” type mystery where the audience knows “whodunit” while we have to wait for the characters to solve the crime. Just watched this episode again; I wanted to be certain before I posted. So the only reason given for why Alexelique wants to be rid of the ghost of Dameon…is that he’s bothering her? Not that he might reveal some hidden secret, or possibly stir up some vestige of a PLOT? 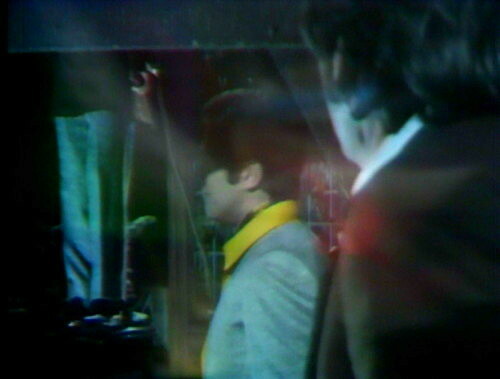 When Yeager finishes the scene where he’s not allowed to take the package, he angrily deploys the blade in his cane – but because the camera zooms to his face, and he’s not holding the cane’s end high enough, the dramatic moment goes unseen (though we do hear the noise as the blade scrapes out). 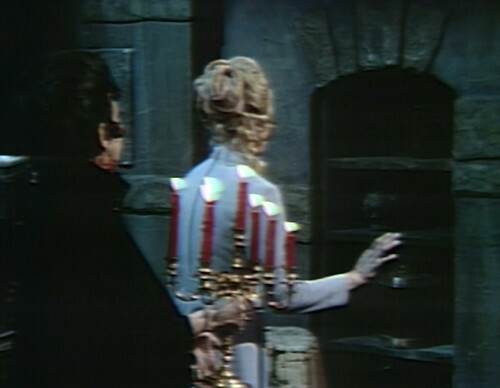 The candelabra contains seven candles. 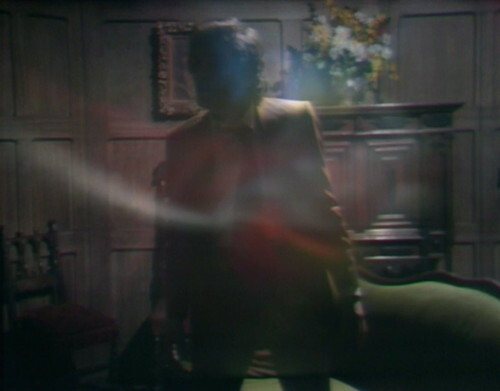 There are only a few points in the scene where all seven are visible, due to the configuration of the piece and the way it is being carried, and when the candles are relit, the doorframe blocks part of the candelabra. But at least the candles aren’t blue. Say what you want about PT, but at least they sprung for a fresh box of beeswax! 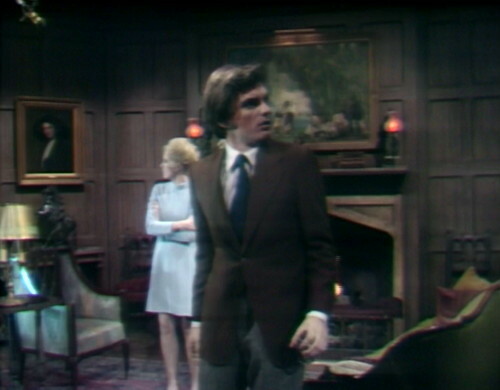 The disused chamber where Quentin is hanged is in the attic of Collinwood, as there are exposed beams and large brick support columns, but seems to have a set of French doors with a window above them. And what looks like shrubbery outside. Is it my imagination or is Dameon having the most fun in his life now that he’s dead? I know! He really must have been a barrel of fun when he was alive. 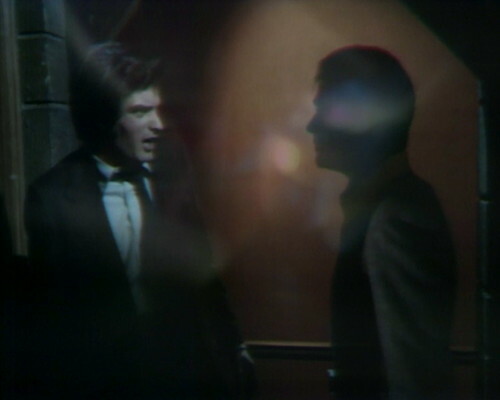 My only question is, if he came back to warn Quentin, why didn’t he ever warn Quentin? He had time, Angelique was still dead…but he wastes his visits in gesturing and giggling. Ineffective use of time, I say. These ghosts, what are you going to do? Why do ghosts bother trying to warn the living about things when “ghost rules” prevent them from imparting any helpful information?